This beautiful set of bells was originally cast in Asten, The Netherlands at the Royal Eijsbouts bell foundry in 1991 and 1992, as a complete, tuned musical instrument. 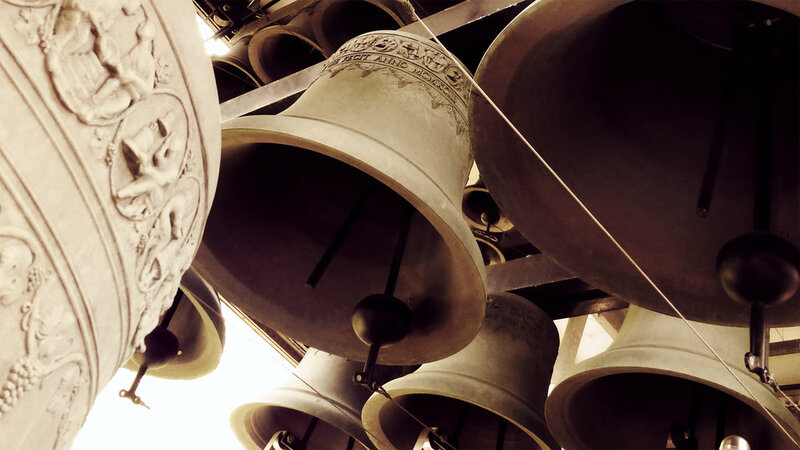 The 48 bells were mounted in a traveling trailer and toured Europe as the Eijsbouts Traveling Carillon for several years before being sold to Chime Master in 2007. Christened as the Chime Master Mobile Millennium Carillon, this instrument was the largest of the three known traveling carillons in the United States. Automated by the Chime Master AutoPlayerTM and still retaining its mechanical action clavier, the instrument toured across the continent thrilling audiences at Renaissance fairs, churches, botanical gardens and universities throughout the United States and Canada. Many renowned carillonneurs from the United States and Europe as well as students of the carillon, have performed special concerts for communities and special events over the years. A search on YouTube for the “Mobile Millennium Carillon” will help you find many videos of live concerts on the instrument. The range is four octaves, from the 2000 pound, 46 inch diameter Bourdon bell, tuned to F natural, skipping the lowest F# semitone, and then chromatic from low G to the highest F natural. The keyboard is transposed to C.
All 48 bells may be played automatically or manually from an organ style keyboard with our Chime Master Air driven AutoPlayer™ automation system.